The final race in our 2012 season brought fourteen racers to Rico Locati's Autumn Hills Raceway in Milwaukie this past Saturday evening. Rico's track is a tight and twisty trek through the beautiful countryside complete with gorgeous fall colors. Theres an off-camber corner on one end and a squeeze corner on the other to keep drivers on their toes. It's a fun track to race on and the action is always close and exciting. Rico had brought the Fickle Fiats of Fate out for another night of NASTE fun. Though not the fastest cars we run, they certainly are well matched. Smooth driving is important here. A few offs can make a lot of difference. In the first set Rico ran a near-perfect run to finish with 47.5 laps. Monte was second a lap down with both Bill and Bryan close behind. Rico's first run was the top run of the night with Monte finishing second followed by Bill, Bryan and Terry. In the ladies classification Dorothy "the Hammer" edged out Victoria by a tenth of a lap, mere inches with Sherry and daughter Chelsea just a bit behind. In the junior classification Russell took the win over his brother Todd. A close night of racing was topped off with a fantastic buffet of deliciousness. A special thanks to Kelly for a great spread. The pulled pork was so tasty that most of us ate until we couldnt eat any more. Then we went back, repeatedly. Amazingly we still had room to wolf down a few of Dorothys wonderful chocolate treats. At the conclusion of the event, the NASTE season trophy was presented to this year's Champion Bill Bostic. Bill had a great season despite never winning a single race. But his mark of consistency with never having a bad run and always being in the top two or three served him well. Congratulations Bill! That concludes this year's season of racing. Next up for NASTE is the Oregon Rally Championship scheduled for June 16th and the NASTE planning meeting for next year that will be held in conjunction with the Rib's n' Racing Summer Spectacular scheduled for August 5 at Monte and Victoria's Jacquelin Park in Hillsboro. We'll hope to see you at one or the other. 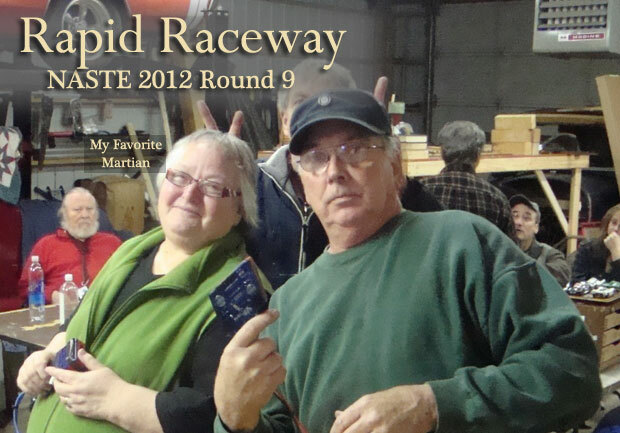 The tenth race night in our series brought eleven racers to Larry Cockerham's Boss Slot Raceway in Carlton this past Saturday evening. Larry's track - the Slingshot - is a fast track with four straights connecting four high-speed turns. The cars sail around the track at a frantic pace and it is easily the fastest track we've raced all year. For our racing pleasure Larry had set up three 1:24 scale hard-bodied open-wheeler cars that he'd recently constructed with brass chassis and Parma motors. These are also the fastest cars we've raced all year. But despite being quite fast they were not unmanageable. 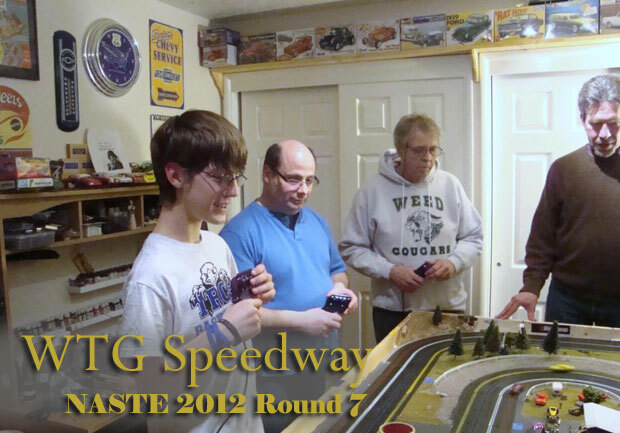 So armed with a fast track and some fast open wheelers the NASTE gang was in for a wild night! And it got there in a hurry as drivers struggled with the difference in lanes, cars and controllers. As the evening wore on we all adjusted and as a result the cars took a beating. Taking the lead through the first set with a fine set of runs was our host Larry with 97 laps. Bill was just a lap behind with Monte another lap off the pace with Rico and Terry sitting at 91. Could anyone best Larry in the second set or would the Curse of the Track Host return to haunt us all? The first contender out of the gate in the set was Rico and he threw down a 96 to pull into a second place tie with Bill - a full five laps better than the first set. Things were heating up! Bill followed Rico and put down a 98 lap set to slide past Larry into first. Larry followed Bill but could get no better than a 96 so his previous total of 97 held down second. Monte was up next and the Big Smooth put it together for a 99 lap set to take the overall lead. When Terry came in with a second set of 95 laps the race was decided. In the ladies classification Victoria took the win edging past Dorothy "the Hammer"and Mary. After the event Monte commented "this is the first 1:24 scale race I've won since I was a teenager". A close night of racing was topped off with a great buffet. A special thanks to Larry, Bill, Victoria and Dorothy for a great spread. We'll see you next time at Rico's Autumn Hills for the final race of the 2012 season. Don't be late! 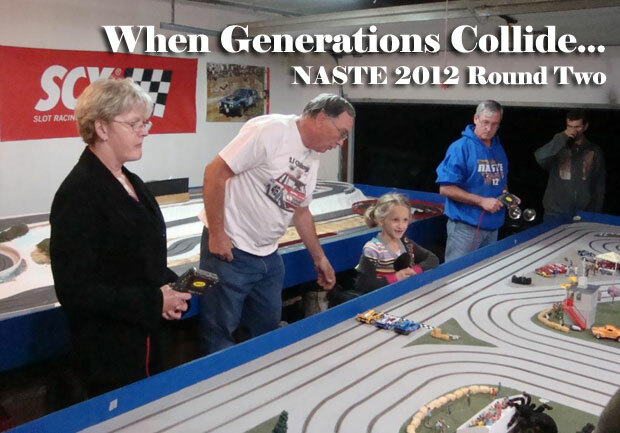 Fifteen racers braved the end of the March monsoons to race the NASTE '55 Chevy's at Rapid Raceway. Howie had the track cleaned, Bryan and Bill tuned the cars up and the ladies brought a table full of goodies to munch on. This is the largest track we run on, and everyone was anxious to throw the cars around that big banked corner. Once the racing got underway, we quickly found out passing a car on the inside of a curve could be just as dangerous as passing on the outside. When the first round was over, the drivers relaxed while the lap counts were totaled. A tight pack of experienced racers found themselves down by almost two laps to Rico Locati. Everyone knows that you have to run twice so there was a chance to catch Rico, but this was also about the time that the rum balls crafted by Dorothy "The Hammer" Abbott started having an effect on the drivers, mostly for the better. After some amazing wrecks, roll-overs and many near-misses, the second round came to a surprise ending, at least in this reporters mind. Sneaking past Rico by less than half a lap to get his first win in over two years was "The Mailman", Terry Abbott. Battlin' Bill Bostic added to his season points lead with a strong third place finish. I want to thank Howie for letting us use the track, and I hope it's not another six years before we get to race there again. I've also got to apologize to him for the muddy mess we made when I parked the car in a bad place. We'll see you next time at Larry's Boss-Slot Raceway. Don't be late! Little cars made another appearance as twenty racers came out to Andre Perra's Riverside Raceway. Andre and wife Suzanne treated us to a fantastic night of racing and an excellent feast prepared with a St. Patty's theme. Andre has a beautiful HO scale track, smooth as silk! As it turned out, Andre had selected cars that were both fun to run and easy to handle. The nights hot-rods were what the HO gang refers to as Slow-Jets- probably just our speed. And as the evening wore on and the racing progressed it became more interesting by the minute, if not longer. In the first set controversy erupted once it was determined that the tires had only been cleaned prior to the start. As the heats went by the discrepancy mounted. It was determined that in the next set the tires would be cleaned prior to each heat. And in the second set with clean tires at the start of each heat lap times dropped and totals climbed significantly. For the drivers that had been late in the first set, the change was amazing. Cars that had been slippery devils magically transformed into winged stallions. At some point it felt like hours turned into minutes... Now some say there was an issue with the clock and that some minutes were longer than others while others say the only true answer for the missing time can be alien abduction. At NASTE we just say too bad! Throttling the little beasties to a first place finish was Flyin' Bryan Trachsel with a little more than a half lap lead over Battlin' Bill Bostic. Finishing another half lap behind in third was our host Andre Perra. We'd like to thank Andre and Suzanne for hosting a wonderful event. The dinner was outstanding and the racing superb. In between we snacked on a variety of deserts topped by Dorothy's famous chocolate experiments. We'll see you next time at Howie's Rapid Raceway. Don't be late! Little cars returned to the NASTE schedule for another night as Flying Bryan entertained us with a field of T-Jets in American Steel trim. The cars were fun to drive, but as is typical for a NASTE race, trouble is not hard to find. And find it we did! Starting off the evening, our fearless leader Flying Bryan set a pace that looked like no one would touch him. After the first set the Flyin' one held a 4+ lap lead over Dave Smith in second with Rico in third. The second set appeared to be more of the same until Rico caught fire. Driving like a man possessed Rico stormed toward the front inching closer and closer to Bryan. Thanks to Bryan and Sherry for hosting the race. And of course a NASTE race wouldn't be the same without some of Dorothy's famous deserts! Once again a great night was had by all. 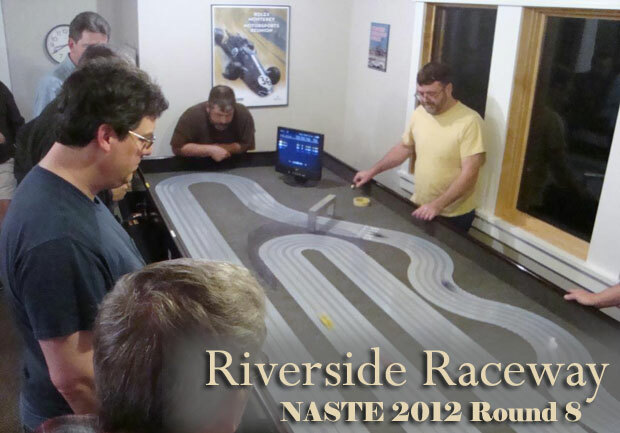 A hard-charging field of nineteen racers turned out for the sixth event of the 2012 NASTE season held on Randy Stumman's four lane Scalextric Sport race track in Beaverton. The cars for the evening were well-tuned Slot.It C-Class racers. Voltage was set to ten volts and the racers were off for two tightly contested sets. It the second set of heats all the drivers did better and some dramatically so. Pulling it all together in the second set with a seven lap improvement moved Flyin' Bryan Trachsel into third overall with 90.2 laps. Holding on to second with a fine two-plus lap improvement was Bill Bostic. And to once again fulfill the curse of the track host, Randy finally got going and finished more than a lap ahead of the field with a solid 92.2 to take the win. Thanks to Randy, Myrna and Byron for hosting the race. And of course a NASTE race wouldn't be the same without some of Dorothy's famous deserts! 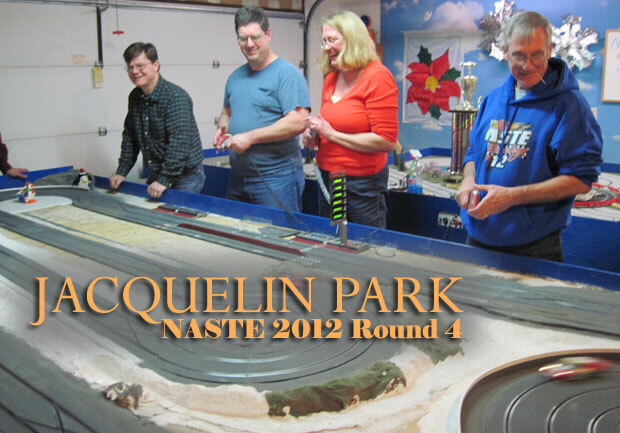 The NASTE 55 Chevys returned to duty for the fifth race of the NASTE 2012 Championship! 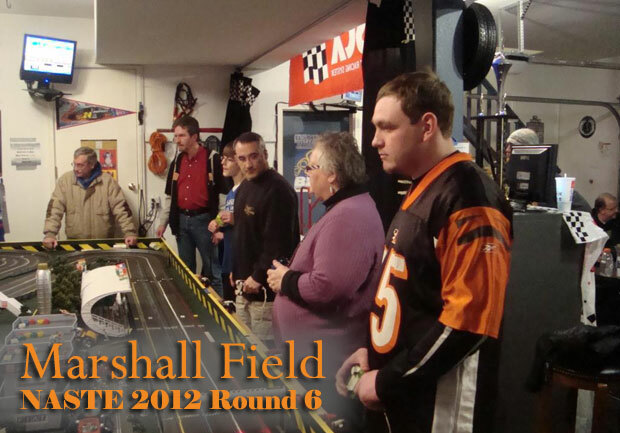 Jeff Courtney's 1/24 scale four lane routed track hosted the race for the group of racers. Dorothy "The Hammer" provided us with some of her finest calorie work to date. Her delicious cakes molded in shapes of cars and trucks were just too cool! As for the racing, three minute heats were run which allowed the new racers time to adjust to the challenging cars, and allowed the veterans time to re-familiarize themselves with the Radioshack power delivery. Typical with the NASTE 55s there was some great crashin' and bashin', highlighted by well placed nerfs, and just plain "take-outs". Surprising to many of us was "The Hammer's" amazing (totally out of character I might add) super clean, super fast, precision racing style that took her to a great finish. The room was a buzz with comments of "is this the new Hammer? "; "Will a new nickname be required? "; "Where has our beloved Hammer gone?". It would appear the inevitable has finally happened; The Hammer is now a full-blown racer! But even with her excellent performance she as well as every else was no match for the un-catchable Dave Smith. Dave took the win with Terry Abbott and Bill Bostic in a tie for second. As usual racing the NASTE '55 Chevy's resulted in a very close field, narrowing the gap between the experienced racers and the less experienced. 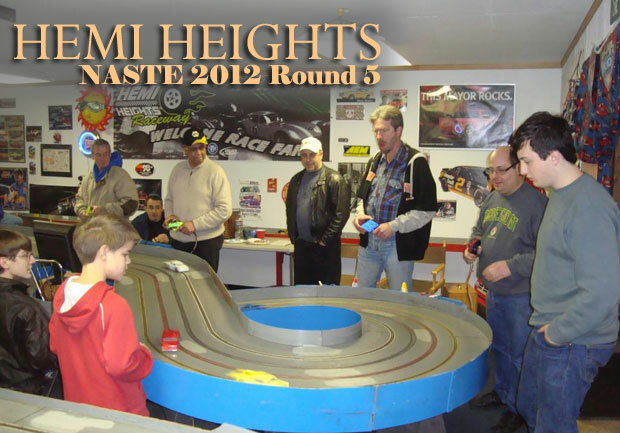 The fourth NASTE race of the 2012 season was held Saturday evening at Monte and Victoria's Jacquelin Park Speedway where a spirited group of fourteen racers came out on a cold winter night to try out the re-designed digital track. After an hour of practice so racers could get re-acquainted with the digital format as well as do a little grazing at the food bar three teams were formed to battle it out Enduro style for the next two hours. An Enduro is a little different than a normal heat race since the heat lasts 40 minutes. And a digital Enduro adds another feature as refueling is required lest your car stop dead on the track out of fuel and also out of the remainder of the heat. So periodically drivers need to pull into the pit area and refuel their cars to continue. At that point drivers are swapped, just like at Le Mans and Sebring. Once the flag dropped Team One in lane one took the early lead. As the heat progressed, the lead stretched further and further. Would they run away with the race or was this just the first symptoms of an IROC race? By the time the first heat finished, the Big Smooth's Team One held a 23 lap lead over Bill Bostic's Team Two with Rico Locati's Team Three another 9 laps behind. And it appeared there could be controversy as one of the cars, the car in position 3, had developed slippery tires. It was clear that the team that could master that car would have a tremendous advantage - if any could. In the second heat Team One once again pulled out the heat win but this time only by a single lap over Team Three while Team Two suffered disaster at the hands of the slippery-tired beast. With one heat remaining Team One held a comfortable-looking lead of 33 laps over team Three but the final flag had yet to drop. It was time for Team One to deal with the difficult car. And deal with it they tried. And while they tried Rico's team came storming back. With ten minutes remaining Team Three had made up more than 20 laps and had closed within nine laps of the lead. Make that eight. Seven! The action was heating up as Team Three continued their charge to the front and time appeared to be on their side as the slippery beast slid around and off the track with relative abandon. With about 7 minutes remaining, Team One made their final driver change and turned it over to the Big Smooth. Driving the track and the slippery beast like he owned them - ok, the beast WAS really slippery - he was able to hold off the charge from Team Three bringing Team One home with a closely fought victory by a slim margin of five laps over two hours of racing. Amazingly, no cars were damaged. No racers were injured. No fist fights resulted. It was an excellent night. We'd like to thank everyone for coming out to help us celebrate the christening of the new layout, we had a great time. The food was great, thank you all for sharing. And then there's Dorothy and those wonderful chocolates. Yum! 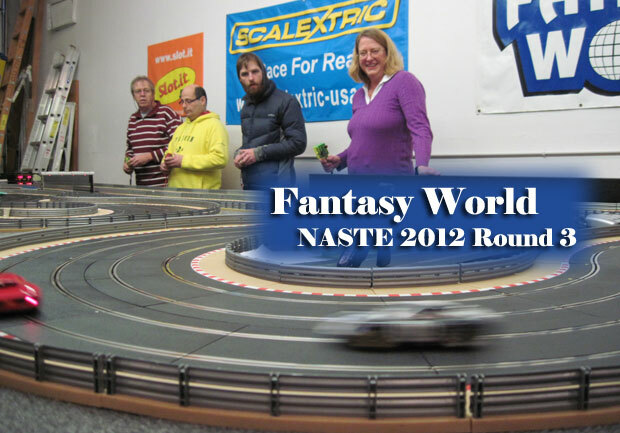 The third NASTE race of the 2012 season was held Saturday at the Fantasy World Hobbies warehouse courtesy of Tony Kuljis. Since that's about a three hour drive from Portland, Bill offered to pilot the NASTE party van and we filled it with eight willing souls. Mike Lombardi met up with us at Fantasy World where we were joined by local hot shoes Tony and John The ProfessorPowers. The Fantasy World warehouse track is a 1:32 scale 4-lane Scalextric track of about 80 ft. The track has a nice feel to it with a set of S-curves and a good sized straight section to unwind. It doesn't take long to feel comfortable. On top of that, Tony had brought along his Racer Ferrari 250LM's. We've raced them before - quality cars that are well tuned without being over-powered. What a treat! After an hour of practice we got down to racing. Through the first set of heats The Big Smooth held a two-lap lead over Rico, The Professor and Tony with Bill and Drew another couple of laps behind. The girls were also charging hard with Victoria holding the lead over Dorothy The Hammer. In the second set, everyone did better than their first set with one notable exception - that guy in front. And as expected, the locals finally got it together and started throwing down some serious lap totals. By the time the smoke had cleared The Big Smooth and The Professorboth had 169 laps while Rico and Tony were tied for third with 167. It was decided to have a run-off. In the end, the locals beat out the travelers but not by much. The final standings showed John first, Monte second, Tony third and Rico fourth. In the ladies division Victoria held on to her first set lead to squeak past Dorothy despite her plying the officials with her famous chocolate treats. 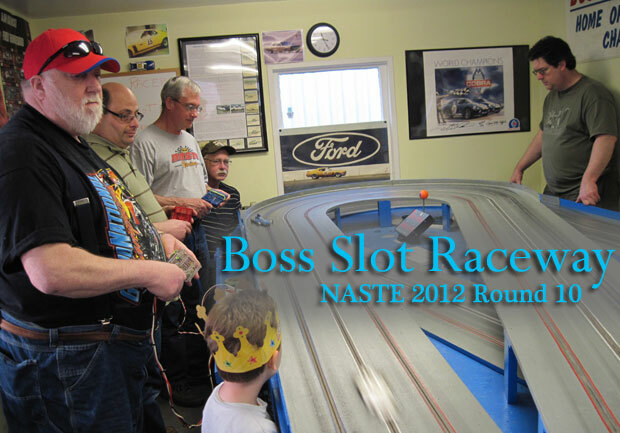 By the time the NASTE party bus returned to Portland after a stop by Alan Smith's 132slotcar.us store and a rather festive dinner in Centralia, all seemed to feel that the day was a great success. A special thanks to Fantasy World Tony and our tour drive Bill for taking good care of us. 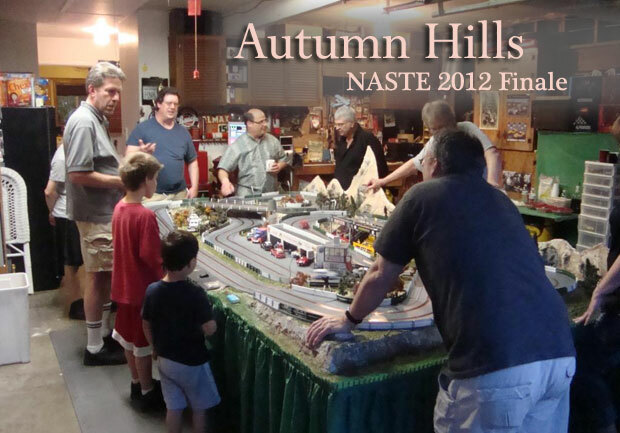 The second NASTE race of the 2012 season was held Saturday at Monte and Victoria's 1:32 scale track in Hillsboro. The Penguin Point track is a 55-foot, 3-lane, wood -routed track with full detailing. The surface grip is outstanding and beginners get the hang of it pretty quickly. On this night twenty racers came to do battle. Monte had set up three of his Ninco McLarens complete with Slot.It running gear so there was none of that Ninco wheel tossing or as much tire hop. Instead what we got was fast and close competition as racers flung those little cars around the track with reckless abandon. After the first set of heats Flying Bryan held a one-tenth lap lead over host Monte with Bill just a lap back and Rico close behind him. Would the home court advantage finally be overturned or could the Big Smooth come back and grab the win? Not to be outdone, the ladies were also battling hard as Victoria held a slim advantage over both Dorothy the Hammer and Diane. And don't forget the kids. They were having their own contests as Russell and Todd were joined by Cailin in her first race! The second round was set for an action-packed finale. In the second heat the drivers were letting it all hang out with most putting down better numbers than in the first set. For starters, Rico laid down 47.7 laps. BattlingBill Bostic followed soon after with a 48.2. Then in the shocker of the evening Bryan fell to 46.9 - nearly a lap less than his first set. And finally it was the Big Smooth throwing down a 48.7 like he owned the track and once again the curse of the host was complete. As for the hostess, Victoria squeaked past the rest of the ladies and earned a 9th place overall finish. Congratulations Victoria, practice really does help! In the junior class the Flood brothers battled it out with Russell in first and Todd second, while Cailin finished third in her slot racing debut! Congratulations to them all. Among the racing action, Victoria organized the Scrabble table, young and old kids played Wii Sports, there was an outstanding selection of food including Dorothy's famous deserts and a special treat - Jill brought a birthday cake for Dave. After the results were announced we all celebrated with cake and a little singing. It was a pleasant end to a great evening. 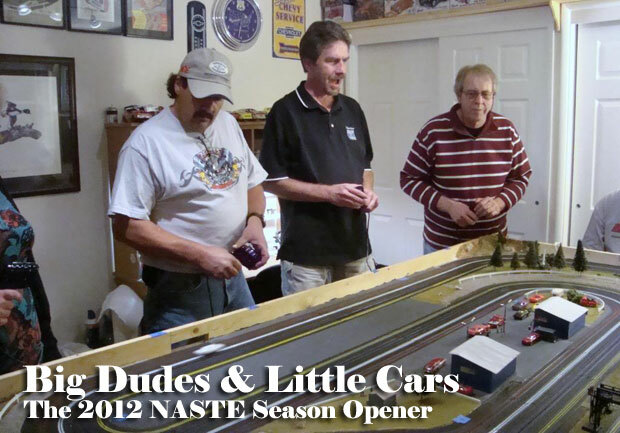 The first NASTE race of the 2012 season was held Saturday at Bryan Trachsel's HO track in northeast Portland. The track is a 4-lane plastic track fully detailed and a lot of fun. It was the big dogs of the HO format that were fast out of the gate and took the early lead after the first set of heats. And the biggest of the dogs was host Bryan scorching the field by 4+ laps. Ouch! Close, well, in second was Dave Smith followed by Battlin' Bill Bostic in third. In the second set Bryan once again broke out the punishment and put another 4+ laps on the field but this time Battlin' Billy got it rolling and moved past Dave for second. Rico squeaked into 4th just behind Dave while Jeff finished 5th. I was handed a 6th place tie with Terry. A hit of the evening were Dorothy's bikini cookies. To top it off, Bryan and Kathy fed us hot dogs and pizza with all the trimmings. Thanks to Bryan and Kathy, it was a great start to a new season.